sheer, utter, 100% mystified disbelief. And then I chuckled … and admonished myself for my snark. Bad Linda. (okay, seriously, as I’m writing this post said son just walked down the stairs after taking a shower and fessed up that he mistakenly washed his hair with soap instead of shampoo and now it feels all weird and hard and stringy. The sleep showering assumption has been confirmed). I gave it two coats of the flat latex in Lucky Charm. And then I gave it two coats of clear wax (I used some Annie Sloan wax I had on hand, but any clear wax would work). The beadboard wallpaper (I really need to get that ‘how to hang’ post written! ), trim, baseboards, and door were all painted with Clark + Kensington’s Designer White. Well…I, for one, love it. Your bathroom looks lovely! Since I just bought a house…I plan to paint 8 rooms plus ceilings! I HOPE to paint my kitchen cabinets 🙂 BTW, I love the after. Your kids’ bathroom look GREAT! 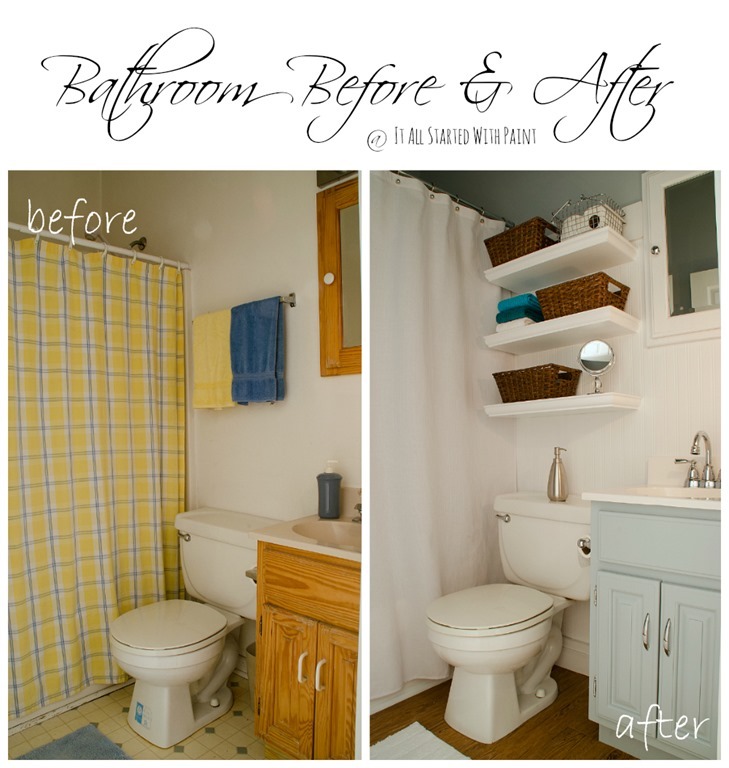 I much prefer the “after” bathroom to the “before”. 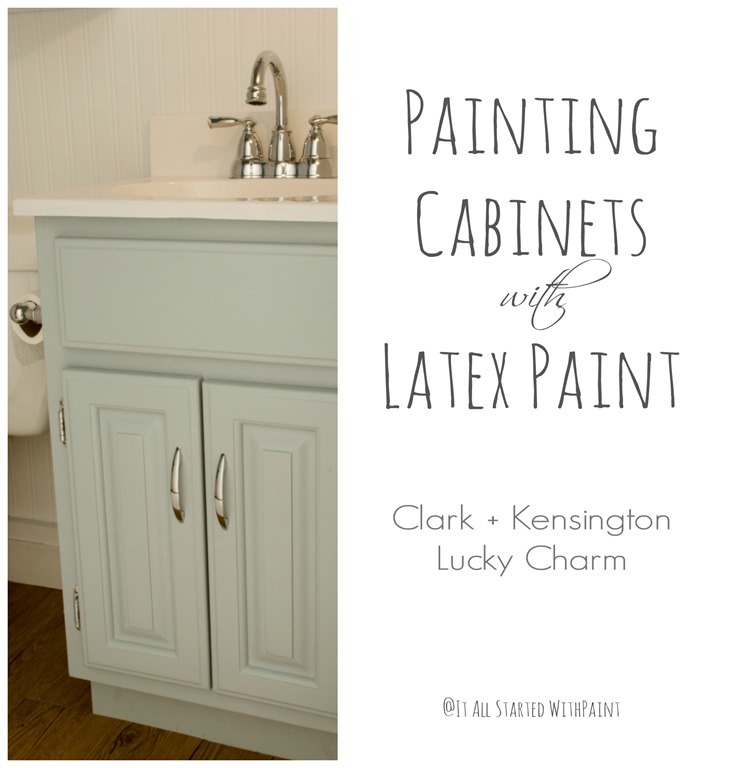 LOVE the painted cabinet. Much improvement. 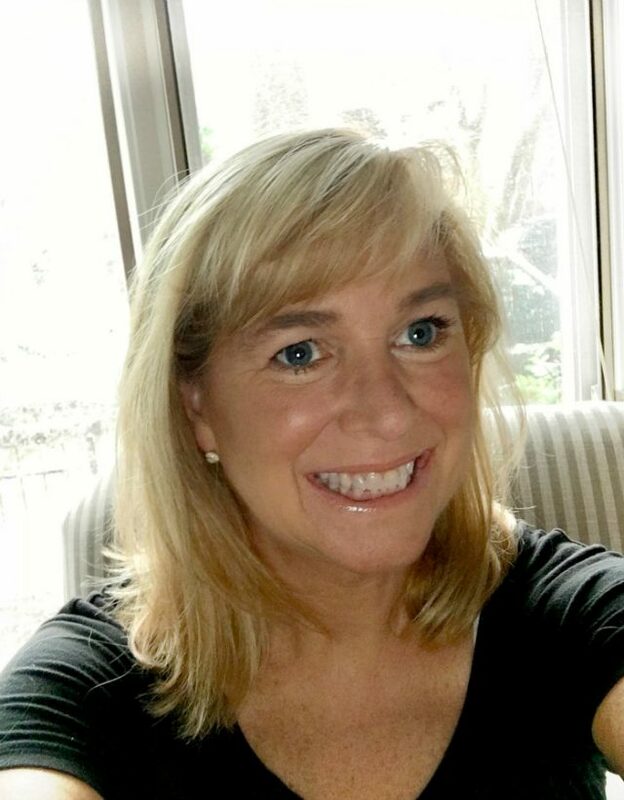 Great job – love it all. I absolutely love what you had done to the bathroom. Something that I want to do to our guests bath. I would like to get the bathroom painted as well as our entry way. 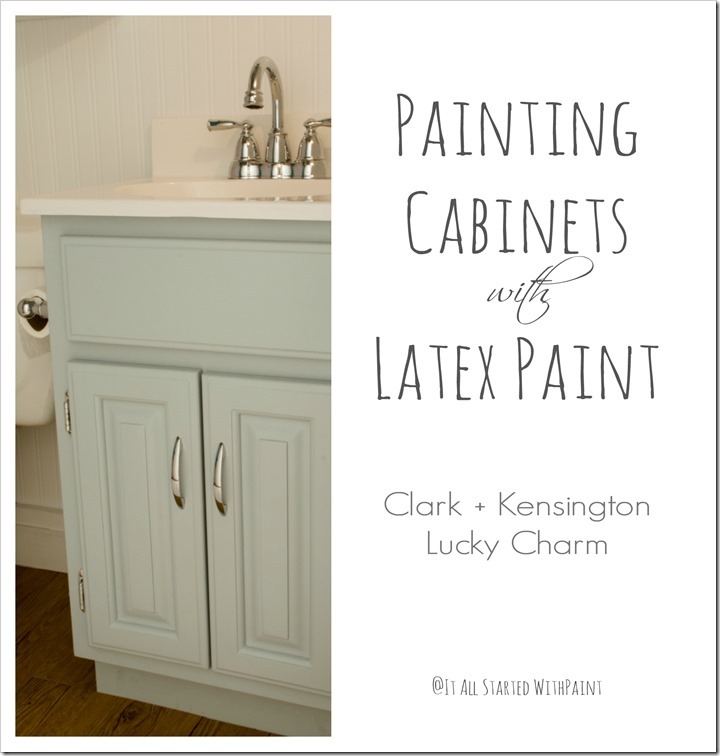 I love that blue it is very soothing .Looking forward to reading your experience with the beadboard wallpaper as I have been thinking of using it in a powder room.The cabinet looks amazing. Great Job… love the colors! I plan to paint my desk, my recliner, my four wood with upholstered seats chairs, my round drop leaf table and many more. We’re hoping to buy our first home in 2014, so I think we’ll have a lot of painting to do! We will paint our computer room next. I LOVE how this turned out!!!! Being that we plan on making a house purchase this coming year I have a sneaky suspicion I will have many a room that start out like your before pic. I hope I can transform them into the after picture. I’m in the loving it ‘after’ camp for sure, hoping to do my kitchen cabinets this year myself. Keep the inspiration coming! I will be painting my laundry room. I plan on painting my kitchen. I love the green, but it’s getting old..
Love the “new” bathroom. Great job. Oh for gosh sakes…. the bath redo is beautiful! Maybe some folks don’t like white shower curtains? In 2014 I think I will paint anything that doesn’t move out of my way. Well I love the “after” look. 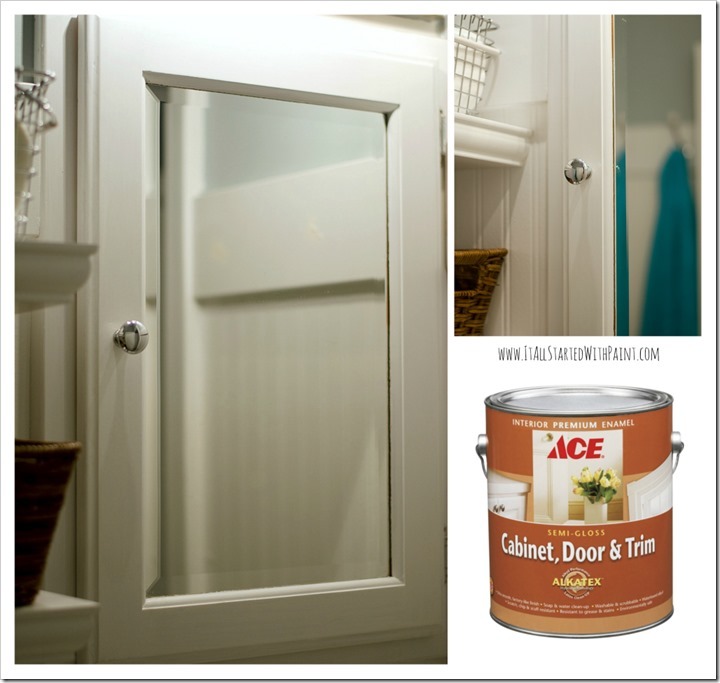 Thanks for the inspiration to paint our cabinet in our upcoming half-bath redo. I don’t like the cabinet we have but was dreading the idea of taking it out and replacing it….now I’m going to try painting it instead! What they really liked was the manufacturer’s label on the front of the toilet, don’t you think? I need to paint my living/dining room but can’t decide on what color! 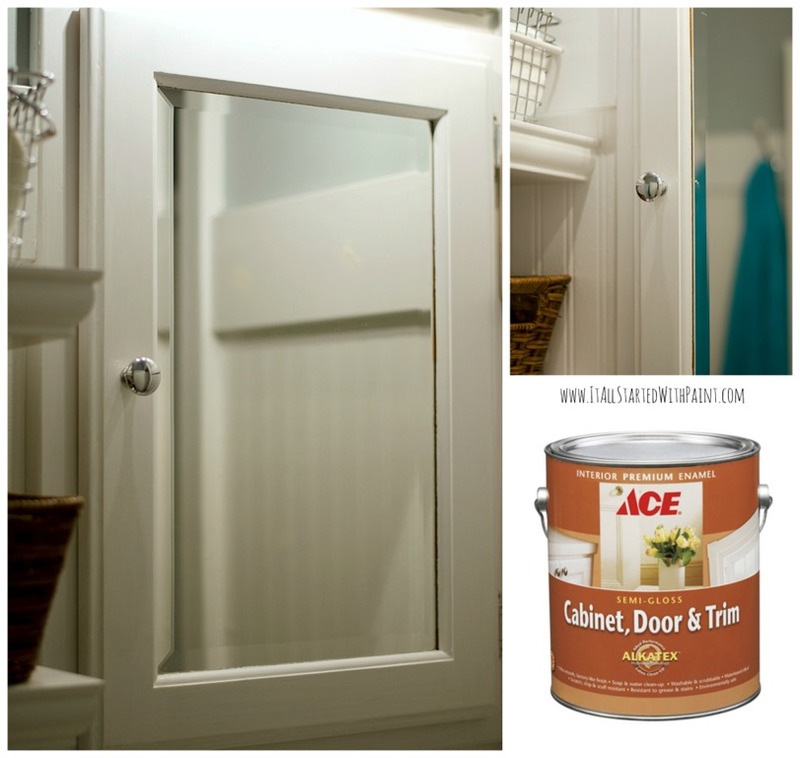 Guest bathroom – to include cabinet – is on the paint list for 2014….. I don’t know what those former bathroom lovers were thinking. The redone bathroom is a huge improvement! I like how the former bathroom still had the manufacturers sticker on the toilet. Nice touch. Love the change and the painting/waxing tips as well!! The colors are gorgeous!! I’m going to be painting my hallway. I’ve put it off long enough. It was on the 2013 to-do list, but has somehow inched it’s way to 2014. No procrastination this time around! Love your colors. In fact, I’ve been looking for a shade much like those. Thank you so much for sharing. my bedroom and my son’s room both need painting the most but all our rooms need painting. Ok so this year we have painted: one kitchen, one dining room, 2 hallways, one foyer, and one study ( navy…. You inspired me). Soooo… In 2014 we will be painting: 2 bathrooms, and three bedrooms, a front porch and a back porch!!! Bring on the paint!!!!! Merry Christmas to you and yours!!! Love the wall color. And for the record, I prefer the “after”. The master bath… right after the final sanding that’s been on the to do list since February gets done. Eyy yi yi! I actually want to paint my kitchen cabinets. I can afford to buy new and mine are over 30 years old and look it. 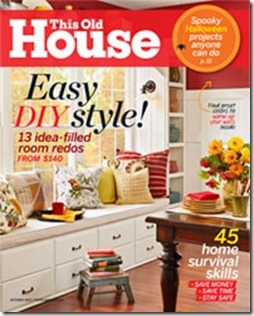 I love the new look and the shelves are great…fantastic colors Linda….Merry Christmas to you and your family!!!! I kind of liked them both. i want to paint my bedroom.. i have only been here a year and when i moved in i painted everything white.. well girlfriend- its time for a change!! Our bathroom and living room. I would love to paint our horribly pepto pink guest room. It was like that when we bought the house, I swear! I love the new bathroom colors. I’ve been looking for a blue for my grandson’s nursery, and I think I just found it. Where shall I start? (I’m planning a total apartment makeover after living here for six years.) In 2014, I plan on painting: the entire apartment’s walls; all of my bedroom furniture; the legs of a kitchen step-stool, two breakfast-bar stools; a wicker shelving unit for my bathroom; a clock; wicker furniture that’s on my balconies plus refinish (sand/stain/seal) my china cabinet and my diningroom table. Happy Holidays ~ I hope 2013 is a great year for us all! Ha, well I can tell the before from the after, and the after is definitely better! I’d love to re-paint my bedroom soon….its a pinkish color that looked pretty and jewel-like on the swatch, but didn’t quite translate. Thinking about a cool blue this time around. 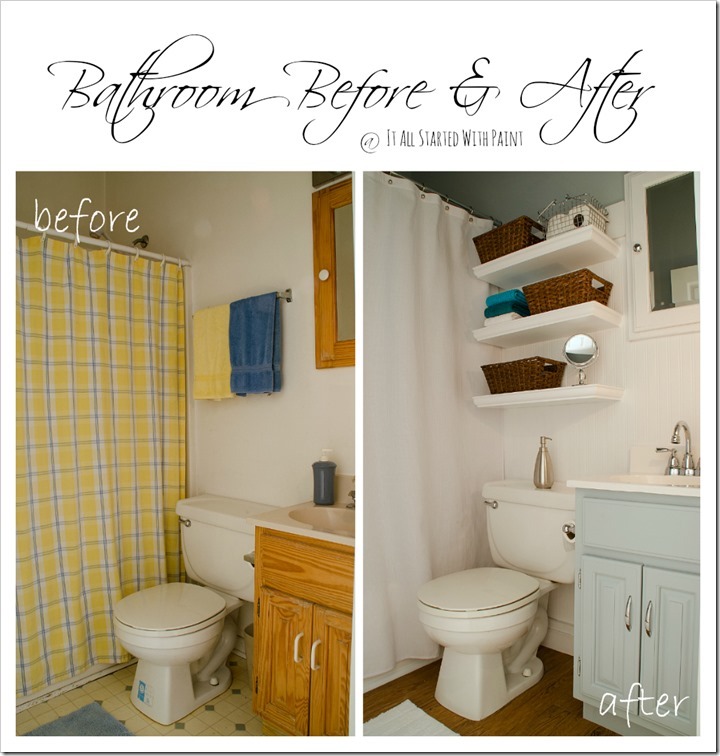 I love the after and have a similar plan for my own bathroom. I plan on painting my dining room. I need to paint my bathroom and some furniture in my bedroom. I have my work cut out for me! Actually, I like a combination of different things from each photo. Before: Shower curtain and towel colors. After: Wood floor and shelves. I think a darker color on the sink/cabinet. Just my opinion. 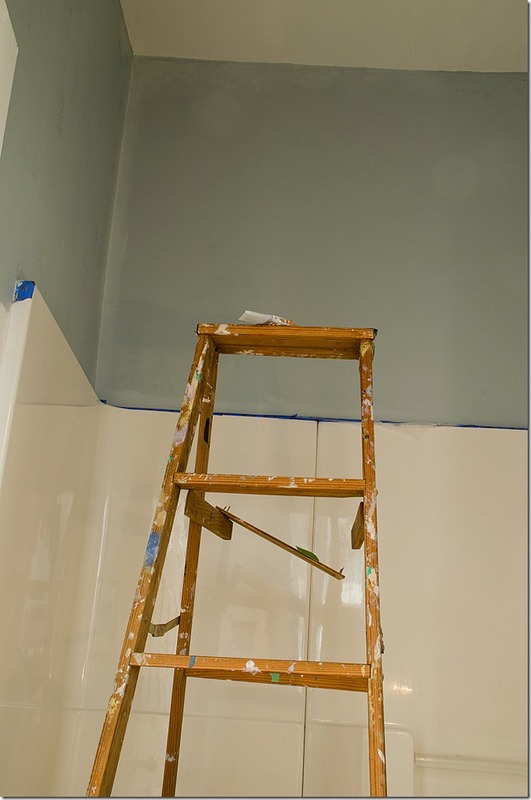 In 2014, I would also like to paint our bathroom! We scrubbed off a lot of paint while trying to clean the walls with a Mr. Clean Magic eraser (oops! lol). I need to paint my son’s bedroom. I plan on painting my bathroom and lots of furniture. I need more color in my life! I plan to paint my kitchen and laundry room. I’ll be painting our hallway. It’s the one place that hasn’t been painted since we built our house 14 years ago! It will probably be 2015 until I get to paint much (the hubs gets out of the army and we buy a house!). I would love to get the card for my mother-in-law, who changes the color of her rooms every week. Home repair is her thang, and she loves Ace! I plan to paint my living room! We plan to help son paint his new house! we’re moving into a brand new townhouse in June and will be painting basically the whole house. I can’t wait!! I plan to repaint the whole house before we move. Just finished stripping wallpaper and painting my livingroom and now onto the kitchen! Thanks for the giveaway! I’m planning on giving my entire house a new paint job during 2014. I probably would start with the living room. I plan on painting my daughter’s room soon. This would really be helpful! Thanks for the great giveaway! I plan on painting a nursery! I have many new painting plans in 2014, one of which is a bath, laundry room and our family room. I hope my bath turns out as good as yours! 2014 will be the year of the paint…. kitchen cabinets and furniture. I got a paint sprayer for Christmas! That’s how I roll here! 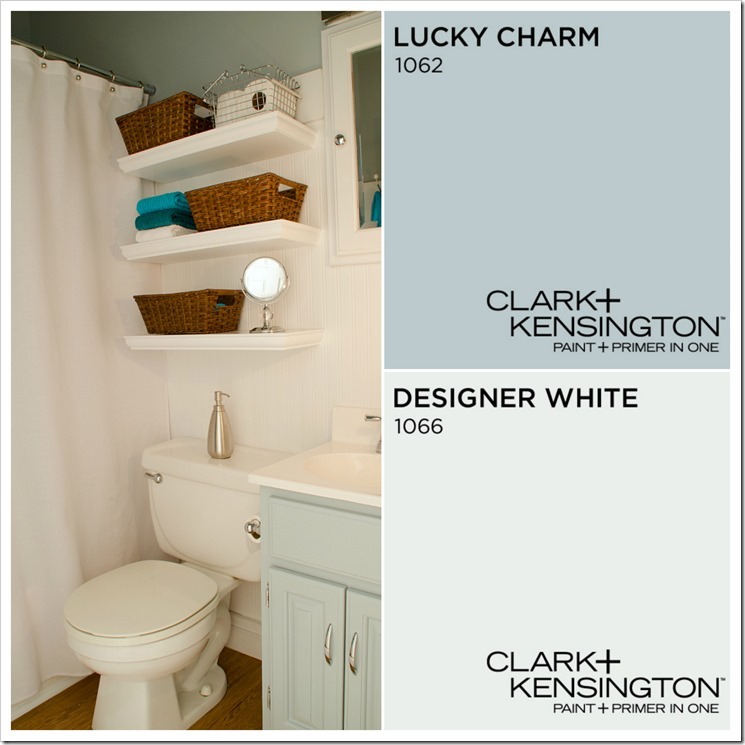 I plan to paint my laundry room for sure, and I’m hoping some furniture. I love your after bathroom! I plan to paint some furniture like shelves and dressers in 2014. Thanks!! I plan to paint my upstairs bathroom. Our guest room is most in need of a new paint job! We plan to paint the inside of our camper a bright blue color. Perhaps those who favored the old version are just being contrary. What a great bathroom. so crisp and clean with those new colors. great job. Happy New Year. I hope you and your family had a lovely christmas. I love the after! Such a pretty grey. 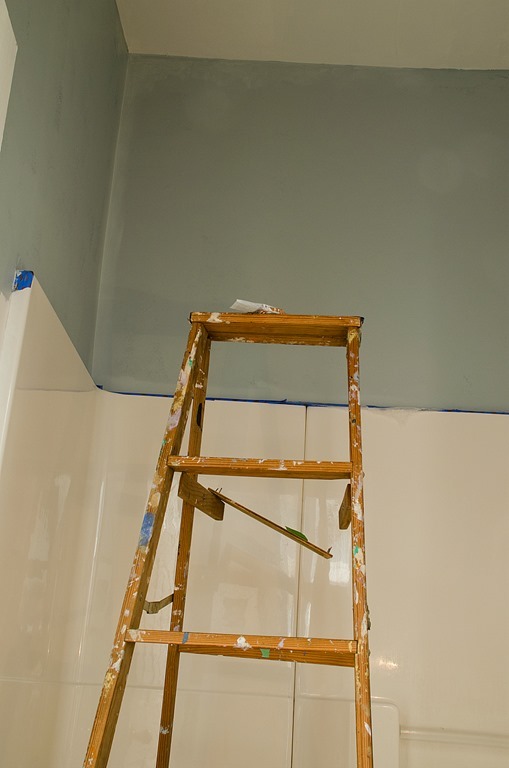 Did you use flat paint for the bathroom walls? Yes, I did. I know some say to go with a satin because it’s a bathroom but I find flat paint to be much more forgiving. And since there is no natural light in the room, the satin would bounce off reflections from the light.